Post by Amine Issa, Ph.D. When you are hiking up a trail with trekking poles, it’s really easy to get lost in the motions... to completely absorb yourself in the technique and enter a meditative state. I have never hiked before, but there is definitely something calming to listening to the sounds of the stream and the wind while prodding your trekking poles in random patches of soft ground. And then it hits you, you look up... and you see a majestic mountain jutting into the sky, eclipsing the previously lofty peak you were admiring the last 15 minutes. The clouds hug the top of your new fascination and create a surreal portrait. I quickly turn to our Sherpa guide, Timba, and ask how high that is and what the mountain's name is (all the peaks are named after gods here in Nepal)... Timba, being the jolly fellow that he is, laughs and says only 20,000 feet and tells me the name, which I soon forget. Mayo researchers pause on the trek up. Now it really hits you... you are humbled by the fact that this gigantic mountain will be eclipsed in the same manner by other mountains like Everest, or as the Sherpas call it Chomolungma “Mother Goddess of the Snows”, which is almost 10,000 feet higher than the behemoth I am currently admiring. I am now in the “Spine of the World”, an endless cascade of jagged peaks that cleaves Asia in two. Eight of the world’s fourteen 8000+-meter peaks are here in Nepal, and four are in Pakistan and flow into the same spine. Disregarding that, there are hundreds of 60000+-meter peaks in the region... just try and imagine that. It's impossible to photograph. Everywhere you look a majestic peak towering over its shorter counterpart greets you... a waterfall gushing from a glacier flows into a river that joins another creating a beautiful scene to admire from the perilous canyon bridges (yes they are like in the movies). Can you imagine what type of people would live in such a harsh but beautiful environment? Humble, dedicated people who recognize their own frailty have accepted that they must live with Mother Nature and its whims or be exterminated by the fury of it. Their way of life hasn’t changed significantly for a millennium. 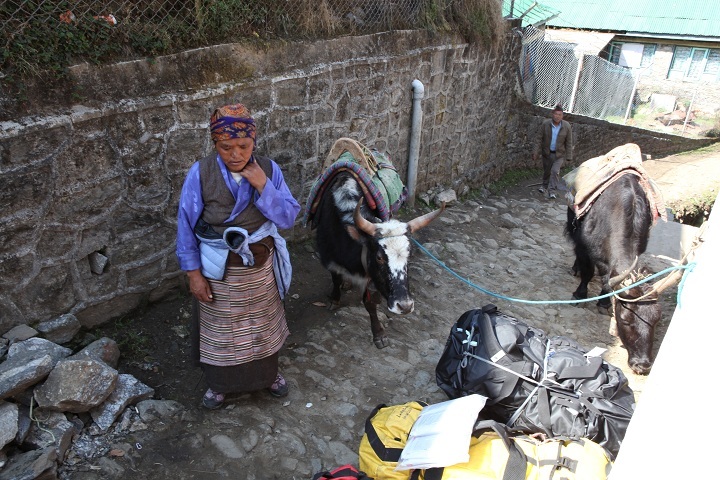 The only way to get food and supplies to the higher areas is to carry them or put them on the back of a yak, no small feat. 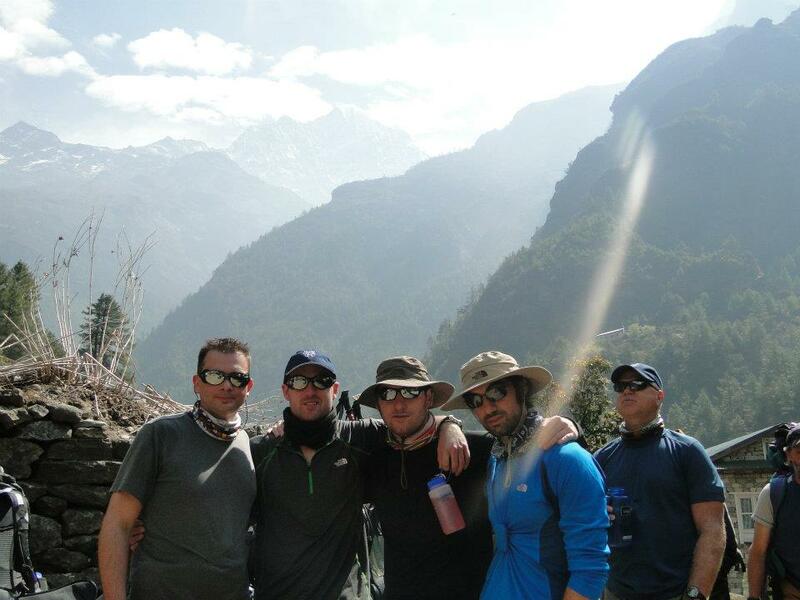 Sherpas carry loads up to 100 kg. The Spine of the World continues to divide these people and their way of life from the rest of the world. With the sea on one side and the impassable wall on the other, is it really a surprise? Put yourself in their shoes, before the modern age of Ipads and Wi-Fi, would you really think there is more to the world past the mountains? Alexander the Great did, when he tried to invade India through a Himalayan pass. Like the climbers and explorers of our age, he wanted to know more, to find out the truth. It takes a certain kind of person, with a certain insanity to do that, and ultimately push mankind forward. 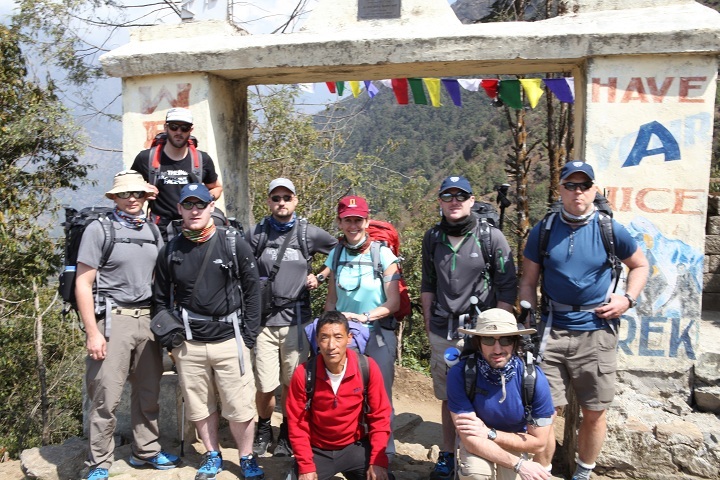 Mayo team at gateway, Sherpa guide Timba front and center. It is here at the Spine of the World, after a hard hike, I sit at a teahouse admiring the view and sharing a hot lemon tea with my comrades that I get to discuss my thoughts and reflections. A small trick: a pinch of rum makes the lemon tea incredible, a sentiment everyone seems to share after brutally mocking me. Moments like these form bonds, the laughter after a hard climb... I became fast friends with North Face’s Derek Campbell, a tall powerfully built but soft spoken man with hands four times the size of mine. Derek is as curious if not more so than me. He also shares my passion for sci-fi, and in stark contrast to the never changing civilization around us, we discuss the not so distant future and the synergy of man and machine, depicted in books like “Singularity is Near” and videogames like “Dues Ex”. It really is not that hard to imagine when you look at how far remote monitoring technology has come; soon enough we will all be a bunch of numbers passing through a computer that will “magically” improve your quality of life and protect you from disease. Derek imagines a world where clothing doesn't just protect you from the elements but improves performance drastically. A world where implants boost performance isn't such a pipe dream if one considers the recent Olympic entrance of Oscar Pistorious, the blade runner with two carbon fiber legs….